Volcanoes are a devastating force that can rip apart the land around them, cover the surrounding area in ash, even temporarily block out the sun’s light. We’ve all probably seen pictures and videos of volcano eruptions, but this image of Sarychev Peak on Matua Island erupting is even more special. It was captured on June 12, 2009 by the International Space Station, which just happened to be in the right place at the right time to catch this unique and incredible picture. 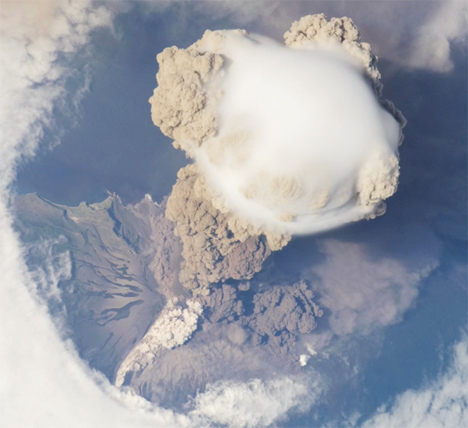 The image shows the volcanic plume rising into the sky, but it also shows a fluffy cloud among the volcanic ash, which is probably condensed water vapor rising with the ash. The image also shows a kind of shock wave as the clouds are pushed back from the force of the eruption. Volcanologists are excited about these unique images because they show several phenomena that occur in the early stages of a large eruption. The above images show Matua Island before the eruption (in May 2007) and just after the eruption. In the left image, the red indicates vegetation, the black indicates water, and clouds, ice and water vapor are white. The gray to dark brown areas indicate volcanic rock, both from old lava flows and from the recent vegetation. Clearly, after the eruption the northwest corner of the island is covered in volcanic ash. Additionally, the coastline appears to have extended a small amount from the new ash and rock deposits. These amazing photos and others like them have contributed untold amounts of new information to our understanding of how volcanoes work, and they wouldn’t have been possible without the technology that allows us to keep an eye on Earth from space. See more in Earth & Nature or under Science. October, 2009.